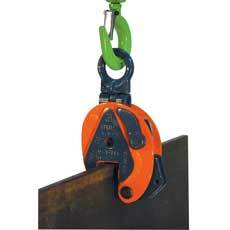 These clamps are primarily used for transporting sheet metal and steel plates in the vertical position, as well as lifting and rotating through 180′. They can also be used for transporting steel constructions and profiles. It is recommended to use a pair of plate clamps in conjunction with a spreader beam for long materials which have a tendency to sag or flex.